I have compiled a gorgeous collection of spring wedding invitations which will also help you get some spring wedding ideas for your special day. Incorporating colors and themes which are currently popular with classic spring themes such as butterflies and spring flowers I think you’ll love this page. If you’re planning on a spring wedding then this page will help you get ideas for possible color schemes as well as themes. Some of the Spring Wedding ideas have been expanded on with more in detail pages that I’ve linked to. This page really is the first stop in planning a spring wedding so let’s get started …….. This chic invitation design really says simple country chic to me and the use of daisies as one of the wildflowers says spring time as well. I really love this invitation and you can carry through the theme with your wedding reception by using mason jars as centrepieces – filling some with flowers and others with tea light candles – this will look stunning. The use of grey as a background color for this invitation is a very contemporary look which really brings an extra touch to your country style wedding. Grey and yellow is definitely a great color combination for a wedding, although it’s not one that you generally see at spring weddings which means your wedding will really stand out if you take your inspiration from this mason jar and wildflowers invitation design. Cherry Blossom weddings are a very popular theme for spring weddings and they are certainly gorgeous to look at. 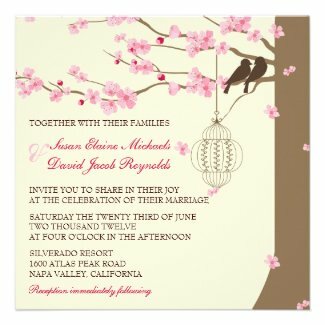 There are quite a few different cherry blossom invites to choose from, but I like this one as it also has a vintage theme to it which is also very popular at the moment. The vintage theme comes from the bird cage that is hanging from the cherry blossom tree which means that it’s up to you whether you want to play on that theme with your wedding or just stick to the cherry blossom theme alone. There’s lots of different things you can do to create a perfect Cherry Blossom wedding with or without the added love birds or vintage twist and you can check out a few more ideas at – Cherry Blossom Themed Wedding. Daisies are a classic spring wedding theme and I think it’s one filled with innocence and beauty – daisies always make me think of my childhood and trying to make daisy chains. If you’re after a wedding full of rustic country charm then a daisy theme could be just the thing. As you can see there’s lots of different styles when it comes to a daisy wedding and these are just the rustic style ones, you can also enjoy much more chic daisy wedding invitations incorporating a lot of different wedding colors at Daisy Wedding Invitations. Lily of the valley is a beautiful flower that is perfect in a bridal bouquet and the white flowers combined with the green leaves provide a gorgeous spring wedding color scheme as you can see with this invitation. This is quite a dramatic daffodil wedding invitation with the black background really making a grab for attention, but daffodils can also be used in a mainly white and yellow or cream and yellow wedding theme as well. With yellow being the color you usually associate with daffodils you can use sky blue, grey and either dark or light green as a great contrasting color as well. As Paris is considered a city of love and romance it’s hardly surprising that so many people like to enjoy a Paris themed wedding. This wedding invite includes a Paris theme with the iconic Eiffel Tower along with butterflies symbolizing spring time in Paris. This really is quite a romantic style of wedding invitation with even a touch of a vintage theme should you want to incorporate that throughout your wedding theme as well! 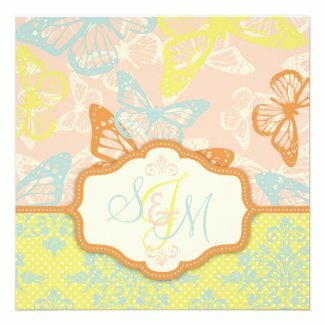 There are so many different styles of butterfly wedding invitations that they actually have their own home on the page below. 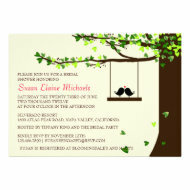 Here’s a few more spring wedding invites to give you some ideas for your wedding. Spring time really is a great time to start on a new path in your life, it’s just up to you to decide what theme you want to start the new path with. If none of these wedding invitations appeal to you then you might want to check out the selections I’ve compiled on the pages below. This entry was posted in Uncategorized and tagged butterfly wedding invitations, daisy wedding invitations, floral wedding invitations, lily of the valley wedding invitations, paris in spring wedding invitation, spring wedding invitations on August 11, 2015 by Lou.